The Brown Eclipse has a circular seat and a lovely sweeping back rest, combining traditional brown with contemporary styling. The panels of premium brown faux leather are stitched together to create a smooth surface which emphasises the circular theme and the luxurious padding. This is a bar stool which offers plenty of support and high levels of comfort. The seat can rotate fully and a gas pump system allows the height to be varied up to 20cm. 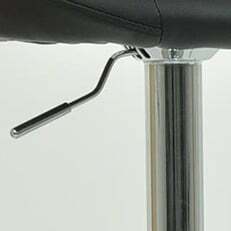 The lower section of the stool is finished in glossy chrome and includes an oval footrest attached to the central column. A floor protector is fitted beneath the circular base. The Brown Eclipse is a bar stool that can fit in anywhere with its luxurious seat and stunning design.